Toolbox is a storage unit which is used to store, protect and carry your tools. It can be used by hobbyists, DIY or professional handyman. Toolbox store all the tools organized at a place and the user can easily find the tools without losing time. Many people think that toolboxes are only for the professional handyman. They count toolboxes as an optional extra. But truly to say, their thinking is wrong. You don’t have to be a professional handyman or pro to need a toolbox. If you’re an owner of a set of tools, then you need a toolbox. Even a homeowner owns at least 10 tools. And a toolbox is the best option to keep them safe and secure. Toolboxes come with locking mechanism and keep your tools secured. It reduces the damage to your tools. It offers a convenient place for all of your tools. It provides quick access to your tools and saves your time. Whether you work as a carpenter, plumber, electrician or contractor, tools are central to most business. And to keep your tools safe and organized, you need a toolbox. But do you know what to consider before buying a toolbox? 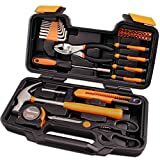 What quality and features should a toolbox have? Here is the guide to let you know what you should consider before buying. I am pretty sure that, after reading this guide, you will be able to pick the best toolbox for your needs. Tool Box has various types of storage, capacity and shapes to hold tools. It can be a small portable box that can carry a few pins and nuts or a large storage system to carry high-end forensic equipment. Some toolbox is portable and some are too heavy and large to be easily moved. Many decision comes down to the personal preference of the buyer. Plastic tool boxes are a quicker, inexpensive and effective way to store your tools to use in your everyday work. These kinds of boxes are often referred to as empty boxes as they are mainly used to store the tools in some place such as in a garage, home or on job site. No matter which toolbox material you decide, make sure that the toolbox provides some organizational extras. It’s better to look for a toolbox that has a lockable lid for security. When you’re looking for extra heavy duty material, then a steel toolbox will be the best choice for you. Steel tool boxes are mainly used where tools or equipment safety and protection is the key factor of business. These models can be a bit pricier. They typically last a long time than the other options. That’s why they are a good alternative for professional and industrial use. Aluminum toolboxes are strong, durable and also lightweight like plastic. That’s why Aluminium is a popular choice. Aluminum toolboxes are a little bit expensive than plastic boxes, but they do tend to last for a longer period. These boxes are highly recommended in sectors like chemical, aviation and transportation where lightweight and durability is the key to a successful business. Waterproof boxes are highly preferred for carrying lances, forensic and testing equipment. These boxes are constructed of structural foam for extra strength and feature an all-around water seal which ensures dry and safe storage. They also have extra storage capacity with a lid for easy opening. The ergonomic soft grip handle of waterproof boxes helps to carry heavy loads easily. Cantilever boxes are a great choice for remodeling professional, carpenters and other professionals who deal with construction work. These boxes are highly preferred for those sectors where quick access to tools and time is the key. These boxes come in unique and professional design. The ergonomic design of these boxes allows you to lift and carry the box with heavy loads. If your plan is to keep the toolbox in a fixed place and weight doesn’t matter to you, then you can store tons of tools in a heavier, larger toolbox. But if you need to take your toolbox on the go, it’s very important to take that into account before buying a box. Make sure to get a toolbox that is enough lightweight and easy to portable, but still sturdy. Tool box’s load capacity is determined by the design and material of the box. The type of someone choose to store in the toolbox decides the weight that a box can hold. High-end tool boxes can sustain weight up to 50 kg while small tool boxes come with as low as 5 kg. The needs of tool storage are different for every person. An electrician needs a different toolbox than a mechanic, a mechanic will need something different than a carpenter. The number of tools a user owns and the amount of space those tools take up partially determine the storage that is needed. The homeowner who wants to put some basic tools for home repair such as pliers, hammer, wrench, screwdrivers and measuring tape, will only need a small toolbox to meet his needs. On the contrary, who owns a garage will require something much more extensive to house a large collection of tools. Other things you should consider are the weight of tools, tool boxes with wheels and the color and coating of the toolbox. A toolbox cannot be completed without some accessories. They enhance the use and efficiency of the toolbox and the tools stored in it. Accessories also help to keep tools organized. Drawer Liners: Drawer liners keep your tools in the spot they were placed in storage. They also help keep small tools from sliding around in the drawer. Drawer Organizers: Drawer organizers keep nuts and bolts from rolling around in the drawer. They are devoted to holding miscellaneous nuts and bolts. Socket organizers, Wrench organizers and Side-Mounting tables are also very useful accessories. 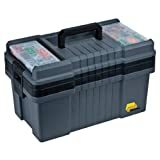 We recommend you to purchase the highest quality toolbox if you work with your tools regularly. You will be surprised how much easier it will be to find your tools in the shortest time. You will be able to complete your job quickly and enjoy your working time! Also, see other tool chests review on Damntools. Plastic or metal? Which one is better? If you need very lightweight then go for plastic one. Metal toolbox usually lasts longer than the plastic one if the metal is stainless.